Tenzin Dechen Rochard has a B.A. (Hons) in Philosophy (University of London) and a PhD in Buddhist philosophy (University of Cambridge). She also completed a traditional 10-year study programme in Buddhist Philosophy at the Institute of Buddhist Dialectics (Dharamsala, India). Dechen translated and edited Geshe Sopa Rinpoche’s oral commentary on the Insight section of Tsongkhapa’s Lamrim Chenmo (Steps on the Path to Enlightenment, Vol. 5, forthcoming, Wisdom Publications). 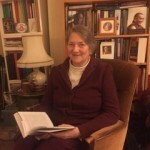 She has been teaching Buddhism, Philosophy, and meditation in the UK and abroad for several years, and is involved with inter-faith dialogue. She is currently working for The Dalai Lama Trust, translating a recently composed compendium of teachings by ancient Indian Buddhist masters of the Nalanda tradition, historically the source of all Tibetan Buddhist traditions.